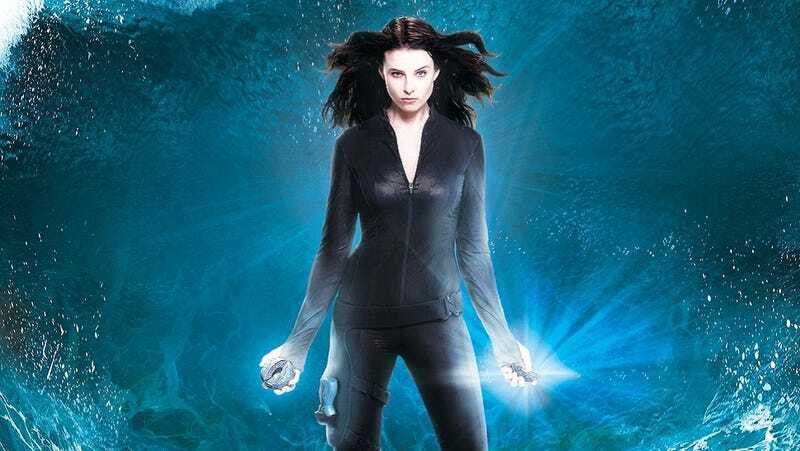 Continuum turns its time-traveling cop into... a superhero? Season two of Continuum launched last night on Syfy, with a modest sort of scene-setting episode. A new status quo is established for Kiera, Alec, and the lovable gang at Liber8. We get a bit more development of the mystery of why Kiera was sent back in time. And this show seems to want to be a superhero epic all of a sudden. This episode picks up some time after the first season finale, and Kiera has apparently gone missing, with all the cops (and Agent Gardiner) wondering where she's gotten to. Meanwhile, she's using her suit's invisibility powers to strike at Liber8 and the Vancouver gangsters from behind the scenes, becoming a vigilante rather than a cop. Eventually, she reconnects with Carlos and the gang, but still decides that she's better off working in the shadows. Like Batman, whom she's apparently never heard of. Of course, Kiera's decision to stop following any semblance of police methods gets off to a rocky start here, because she fingers the wrong guy for the assassination of the mayor, and plays into Liber8's plans to make Tahmoh Penikett's Jim Martin the new mayor. And meanwhile, Alec has moved out of the family farm into an apartment with a group of young gamers, who blast their loud music, and he's trying to get a job working at the Buy-More with Chuck and the gang. (Basically.) In the meantime, Alec is blowing off both his poor mom and Kiera, because he's trying to process the message from his future self that he found hidden inside Kiera's suit's memory. Kellogg is still having an uneasy on-again, off-again affair with Kiera, even though she pretends to be disgusted with the ex-Liber8 member. And she's not above blackmailing him for cash. And in one of the episode's more promising developments, Travis survives being shot and left for dead by Liber8's new leader, Sonya. And this leads to him winding up in the same prison as Alec's cousin Julian, who's destined to become Theseus, founder of Liber8 in the future. Watching the two of them bond in prison could actually be kind of entertaining, if the guards don't follow through on their threat to separate the two Liber8 plotters. But we're kept waiting until the very end of the episode before we find out what we've been waiting to learn, and even then it's a bit vague. Why did Future Alec send Kiera and the Liber8 gang back in time? Apparently it's because he feels like he's gone down a dark path and taken the world with him, what with leading one of the evil corporations that dominates everything. And now he wants to change the timeline, so the world he lives in never comes to pass. So is Future Alec completely in league with Liber8? We saw him meeting with Kagame before Kagame's escape to 2012. If their goals are completely in sync, did Alec plan all of Liber8's actions in the past? And if that's the case, then I'm still confused about why Kagame had to sacrifice his life to cause a bombing that was already part of the past timeline that gave rise to Future Alec's corporate empire. First of all, that bombing was already part of established events, so nobody needed to go back in time and make it happen. And second of all, if your goal is to change history, then it's not clear why you'd expend so much effort to make sure history plays out as it previously did. In any case, this show is playing with some nice ambiguity — Kiera confesses she's no longer entirely sure whether she wants to preserve the timeline she came from, even though she still wants to get back to her family. And Kellogg says it's entirely possible they've already made enough changes to erase the timeline they came from. In essence, we're treading on the same sort of territory that made Terminator: The Sarah Connor Chronicles such a compelling piece of television, such as all the moments where we realize that Derek Reese and Jesse come from two different futures. Let's hope Continuum can navigate those waters with half the skill and cleverness that T:SCC did.